Back in 1991 director John Singleton single-handedly changed the face of cinema. Not only did sociopolitical drama Boyz n the Hood earn the 23-year-old the accolade of becoming both the first African-American and youngest person to receive a Best Director nomination at the Academy Awards, it more importantly changed the way in which the black youth of America were perceived amid widespread police brutality and a media frenzy demonising gang culture. Through a movie of immense power and wisdom, Singleton was able to give a face to both the victims and the victimised. With the barriers well and truly broken, there would be a surge in movies of this ilk, most notably the devastatingly unsympathetic Menace II Society, and in 1992 ‘thug life’ rap star Tupac Shakur would try his hand at acting in Ernest R. Dickerson’s New York-based Juice, which highlighted many of the themes featured in the groundbreaking ‘Boyz’, including peer pressure, wasted talent and a sense of the irrevocably futile; but the main theme here is the necessity of earning respect, and how far a person will go to get it. Juice also highlights the fact that there is the potential for good and bad in every one, although as respected local Trip (Samuel L. Jackson) so bluntly points out, most times it is impossible to make the distinction. Much like Boyz n the Hood, there is a sense of nostalgia permeating events in Juice, at least when we first meet our four friends. Q, Bishop, Steel and Raheem are your typical neighbourhood kids entrenched in the cultures of music and fashion, but ultimately distracted by gang culture and the necessity of ‘getting on’ in a society that has no place for them other than the welfare queue or jail. The four friends watch both paths unfolding, and while kids like Q (Epps) bury themselves in artistry, others like Bishop (Shakur) are drawn to the glamour of crime and the prestige it ultimately brings. Q is the strongest of mind, but reluctant in the face of violence. Bishop is a young thug with delusions of notoriety, talking smack and getting into scuffles with local gangs as the media continues to exploit the young and desperate, propagating the very violence they appear to decry. Q – You known me since I was a kid. Trip – I known lots of killers since they was kids. The movie focuses on decisions, or the lack available to the ghetto’s potential up-and-comers. Q has designs on being a DJ, and when his talent is recognised by local events planner Ruffhouse M.C. (Queen Latifah), Q decides to get serious and enters battles with other local scratch artists, but Bishop has other plans, and he is unwilling to stand aside and watch others succeed. Instead, he has decided on a path that will see him crash or burn, and he has no intention of going it alone. Bishop is sick and tired of being on the bottom rung of society and feels it’s about time the gang went out on the streets and got their ‘juice’, but Q sees respect as something else entirely, and feels it has to be earned, not gotten. Raheem and Steel are somewhere in the middle, the former enticed by the fruits of a corner store robbery, the latter an easily led sheep who is happy to simply belong. With those kinds of odds, Q is pressured into staying loyal to his crowd, but for Bishop this is more than a simple stick-up. He wants the kind of notoriety he admires on the streets, and soon the four of them are on the road to self-destruction. Kid [to a reluctant Q following his battle with Bishop] : Yo, you got the juice now, man. Dickerson has a sharp eye for ghetto youth culture, offering condolence for the plight of the underprivileged while never becoming overly sympathetic, a factor that is crucial for movies of this nature. Q steals records, but he does so through the temptation of artistic endeavour. Bishop deals dope, but he does so to support his family as his addict father zones out under the pressure of ghetto life. He also captures the inner child in characters who are forced to grow up prematurely. Here, fashion and music are religion, video games act as a conduit for violence, and playful kids swap their school books for ghetto blasters as soon as their parents’ backs are turned. But as in Mathieu Kassovitz’s La Haine, idle hands are the devil’s plaything, and though the movie’s kids are juvenile at heart, this is as much a curse as a blessing, as the four find themselves ‘pimp-rolling’ toward their inevitable demise. The movie is by no means perfect. The tone is somewhat muddled, leaping from moments of slapstick comedy to devastating violence, while the final act meanders through a protracted chase scene brought to a conclusion by the kind of ironic twist that fails to fully register. The police play too much of a peripheral role also, appearing as caricatures who seem detached from the criminal world they are very much central to. Perhaps as a way to bring levity to proceedings, there is an often quirky edge reminiscent of Spike Lee’s Do the Right Thing, but the balance is a little off and the movie sometimes suffers as a consequence. 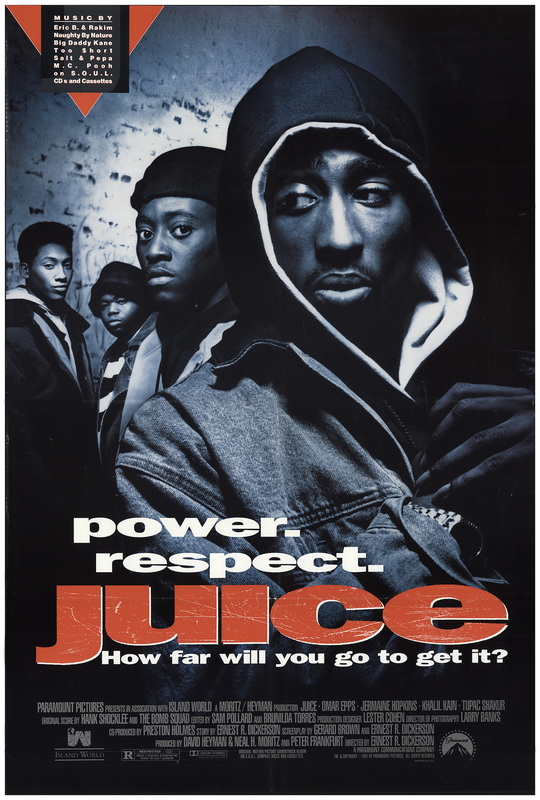 Juice may pale in comparison to Singleton’s masterpiece, but there is still much to admire here, particularly the star turn of a young Omar Epps, while Tupac Shakur puts in a formidable performance as the irrepressible and snakelike Bishop, presumably drawing on his own experiences of life in the ghetto. Bishop is a seething shadow just waiting to pounce, egregious and irked by the prosperity and fulfilment of his fellow man. It is this jealousy and determination to drag others into the mire that punctuates affairs. In the end, these kids have been led to believe that their futures are without hope, and instead of aiding his brothers in escaping that trap, Bishop instead sets out to disable their potential, becoming the living embodiment of society’s preconceptions. It is because of these attitudes that ghetto life has become somewhat self-perpetuating in modern society, and you have to believe that we didn’t reach this juncture organically.